Performer-Link timing chain sets are for use with Edelbrock or stock cams. They have a solid-bushing chain for a true bearing surface that rolls with the sprockets, eliminating chain stretch. Cam sprockets are made from 35,000 psi tensile strength cast iron. Crank sprockets are made from billet SAE-1144 steel and induction heat treated. Three Performer-Link sets are stock replacement parts and 50-state legal (see listings in bold type). All other sets have three keyway setting points to ensure accurate timing selection for early or late-model vehicles. Performer-Link timing sets are not for use above 6500 rpm. 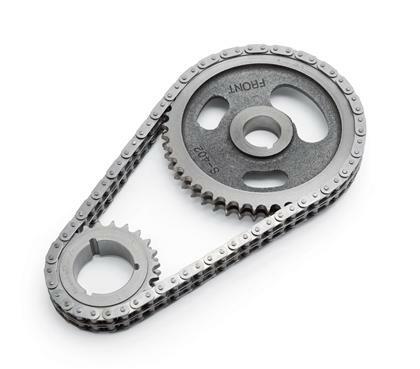 Now, you can dial-in your camshaft with ease with our new Hex-A-Just Roller Timing Chain Set. Made from induction hardened billet steel, it allows for a quick cam timing adjustment to plus or minus six degrees without removal from the engine. You merely loosen the cam bolts and dial-in the cam timing with the turn of a hex wrench. This timing chain & gear set is designed for high-performance street and competition S/B Chevys operating in the 6500-8500 rpm range. #7880 withstands a higher operating range than other timing chains due to the machined link holes and high-strength steel. In addition, the chain links and pins are cold-hardened for greater strength and durability. Nine keyway setting points ensure precise timing selection. Gears are machined from SAE-1144 stressproof steel,have a larger tooth contact area and are induction hardened.